I wonder how hard I make God laugh when I start planning things? I figure my plans must be worth days of entertainment. Of course that’s not really much when we are talking about eternity, but still, it sure seems like He would clue me in a bit earlier. Of course I know I can’t blame Him. This only happens when I start making my own plans. If I seek God and His plans then I tend to get shockingly accurate details. For example, I’ve done my sermons a year out the past couple of years. I take time to pray before, not just a quick breath of prayer before my pen hits the paper but days of prayer. Then I print out a calendar and start filling in themes, ideas, scriptures … whatever comes to mind. I occasionally feel like leaving a space blank. I assumed the first time that those were days that I would be getting details about later or something. The thing is, all of those days were days we either didn’t have service because of the weather or days I wasn’t there. I have been planning to do a series on a book called “God-o-logy” for a year now. I keep getting other things that push this book off of my schedule. I had planned once again to start this book in a couple of weeks, but tonight I ended up on a tangent and that led to a change to my plans. I believe that God led all of this. I began talking about how I’m tired of the same old thing and of hoping for things to be like they use to be. I want something new and I want to see a revolution. Then we got started talking about how everyone wants to see that too but they don’t know how. They don’t know how to tell others about Christ. We are starting a new series on how to witness. I am building it around a book I’ve read The Seven Principles of an Evangelistic Life. As I build this I think I would like to post about the lessons to encourage and get feedback to better teach the series. Part of this series will be practical challenges every week. It isn’t enough to talk. I want to encourage people to actually DO something. What are your experience with evangelism? Have you told people about the good news? What challenges do you face? What practical challenges should I put in front of the young adults? I’ll be honest, I hate books and series on “how to witness.” The best times when the Holy Spirit was working was when the other person came to me and started asking all the questions. I don’t think I’ve ever had a good witnessing experience when I shared the Romans Road or the 4 spiritual laws. I think talking with them and finding out what they really want in life and see how Jesus can fulfill that. I feel much the same way when presented with a “formula” but that is one thing I liked about this book. It really isn’t that formulaic but instead focuses on issues of what evangelism is and isn’t while presenting life habits that will encourage witnessing. 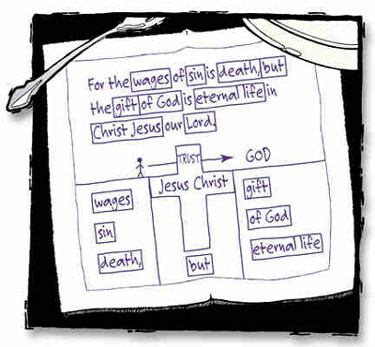 I do want to show the group formulas and different approaches to evangelism. I think we are unique people and for some of us that works, but more importantly I want them to experience what it is like to try and use those approaches when it isn’t really who they are. Evangelism is NOT my strong suit – but being a real person is. A year or so ago I lead a DVD study with Bill Hybel’s “Just Walk Across the Room” series. It was evangelism on a do-able level, and was a hit with the entire group. We got fired up. I love how God comes up with ideas for us that we didn’t even think existed… I love how He intertwines everything and connects all the dots…and we didn’t even know we were in the midst of a connect-the-dots picture. I have to admit that I lack in personal evangelism. I’ll look into the series you mentioned. Thanks. Practical challenges…. hmmm… Don’t use a formula. “When you die, and God asks you why He should let you into Heaven, what are you going to say?” Where does scripture say there will be a pop quiz? And just because someone doesn’t use the same verbage they do, it doesn’t mean they aren’t a Christian. Yes. I’ve been on the “receiving end” where people refused to believe I am a Christian because I won’t use their verbage to describe my faith. Not only is it a waste of your time to be this way with fellow Christians, I don’t think it is much less annoying to nonbelievers. How do I tell people the Good News? When sitting in the Intensive Care Waiting Room while Mom was there, I’ve talked with others who were worried for their loved ones, and themselves. Sometimes I’d ask if they want pray together. Other times I would just tell how glad I am to have God watching over us and let their questions take it from there. At a party, if someone mentions a “How could God allow _______ to happen”, I’d share that God doesn’t cause disaster, but redemption. Of course, that becomes a full blown discussion, rather than a pat answer. The challenge is to be in a place spiritually where this conversation flows naturally rather than from a formula. When people have Jesus shared with them in a natural rather than formulaic manner, they are more likely to respond with “I wish I believed that” than with “Man, you are crazy.” Not that “natural” is the new “formula”. People have the ability to choose God or not. The challenge is to treat them as people with God given dignity . But most (not all) people who are treated with dignity, respond in kind. Oh, and these conversations aren’t a one time only thing. They are an investment. If you know the person, they will come to you over and over sometimes before their heart is ready. And if you don’t know the person, be willing to get to know them. Otherwise, odds are unlikely that this is someone they should be sharing with. Not that I don’t believe in the Holy Spirit moving someone to share with a stranger. I’ve seen it happen. But most of the time, I think we are called to share in relationships we are already in. I agree, I love watching how Jesus talks to people in the gospels. He never beats them up but somehow has all the right words to change their lives. I think it is because he values people who are cast out by society. Having been in the hospital for extended times with 3 of my kids I can totally relate to the relationships that are formed in the waiting room. Relationships are so important. Also, not too long, very good.